Place chicken in 13- by 9- by 2-inch glass baking dish. Mix lemon juice, vinegar, lemon peel, oregano, and onions. Pour over chicken, cover, and marinate in refrigerator several hours, turning occasionally, or overnight. Sprinkle with salt, pepper, and paprika. Cover and bake at 300 ºF (150 ºC) for 30 minutes. Uncover and bake for added 30 minutes or until done. 330 members have added this recipe to their cookbook. This would have been better possible if there had been some chicken broth mixed in with lemon juice so it wasn't so tart. It would have also made more "gravy" to serve over the chicken. It was a little tart for us and we love lemon. I would also probably omit the sliced lemons next time. Just don't add the salt and substitute apple cider vinegar for the white wine and cayanne pepper for the black. Great without the lemon juice. 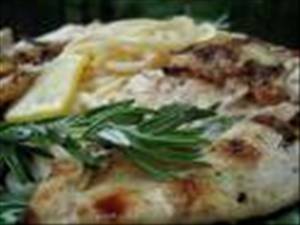 There are 213 calories in 1 serving of Lemony Chicken. Calorie break-down: 10% fat, 13% carbs, 77% protein.